What is Stock Based Compensation? Stock Based Compensation (also called Share Based Compensation or Equity Compensation) if a way of paying employees, executives, and directors or a company with ownership in the business. It is typically used to motivate employees beyond their regular cash based compensationCompensationCompensation and salary guides for jobs in corporate finance, investment banking, equity research, FP&A, accounting, commercial banking, FMVA graduates, (salary and bonus) and to align their interests with the company. Shares issued to employees are usually subject to a vesting period before they can be sold. Compensation that’s based on the equity of a business can take several forms. Companies compensate their employees by issuing them options or restricted shares. The shares typically vest over a few years, meaning, they can not be sold by the employee until they have reached their vesting date. If the employee quits the company before the shares are vested, they forfeit those shares. As long as the employee stays long enough with the company, all of their shares will vest, which they can sell and thus convert into cash. The easiest way to understand how it works is with an example. Let’s look at Amazon‘s 2017 annual report and examine how much they paid out in equity to employees, directors, and executives, as well as how they accounted for it on their financial statementsThree Financial StatementsThe three financial statements are the income statement, the balance sheet, and the statement of cash flows. These three core statements are intricately linked to each other and this guide will explain how they all fit together. By following the steps below you'll be able to connect the three statements on your own..
As you can see in cash flow statementCash Flow Statement​A Cash Flow Statement (officially called the Statement of Cash Flows) contains information on how much cash a company has generated and used during a given period. It contains 3 sections: cash from operations, cash from investing and cash from financing. below, net income must be adjusted by adding back all non-cash items including stock-based compensation to arrive at cash from operating activitiesOperating Cash FlowOperating Cash Flow (OCF) is the amount of cash generated by the regular operating activities of a business in a specific time period. The operating cash flow formula is net income (form the bottom of the income statement), plus any non-cash items, plus adjustments for changes in working capital. In 2017, for example, Amazon paid $4.2 billion of share-based compensation to its employees. Since the company has approximately 560,000 employees, that works out to about $7,500 per employee. When building a discounted cash flow (DCF) modelDCF Model Training Free GuideA DCF model is a specific type of financial model used to value a business. DCF stands for Discounted Cash Flow, so the model is simply a forecast of a company’s unlevered free cash flow discounted back to today’s value. This free DCF model training guide will teach you the basics, step by step with examples and images to value a business, it’s important to take the impact of share compensation into account. 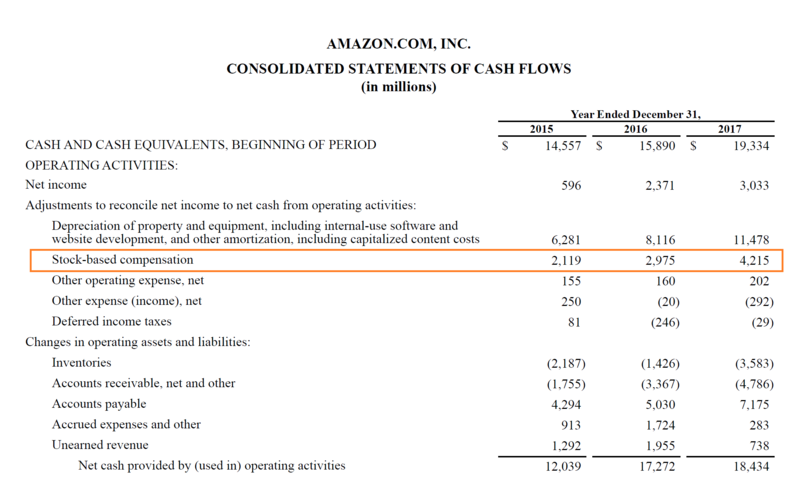 As you saw in the example from Amazon above, the expense is added back to arrive at cash flow, since it’s a non-cash expense. While the expense does not require any cash, it does have an economic impact on the business, since the number of shares outstanding increases. Treat the expense as a cash item (don’t add it back). Add it back and increase the number of shares outstanding by the number of shares awarded to employees (both vested and non-vested). Thank you for reading this guide to understanding how companies can compensate their employees with equity incentives. CFI is the issuer of the Financial Modeling & Valuation Analyst (FMVA)™ certificationFMVA™ CertificationThe Financial Modeling & Valueation Analyst (FMVA)™ accreditation is a global standard for financial analysts that covers finance, accounting, financial modeling, valuation, budgeting, forecasting, presentations, and strategy. , designed to transform anyone into a world-class financial analyst. Investment Banking Salary GuideInvestment Banking Salary GuideOur investment banking salary guide covers several jobs in the investment banking sector and their corresponding ranges of salaries for 2018. There are three main areas in an investment bank: investment banking division, sales and trading, and asset management. Financial Analyst Salary GuideFinancial Analyst Salary GuideIn this financial analyst salary guide, we cover several financial analyst jobs and their corresponding midpoint salaries for 2018. Financial analysts are responsible for examining financial data and their findings are used to help businesses come up with decisions, mainly for investing.